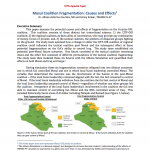 Mosul Coalition Fragmentation: Causes and Effects. Author | Editor: Astorino-Coutois, A. (NSI, Inc) & Krakar, J. (TRADOC G-27). the tactical coalition, the plethora of disparate groups fighting on the ground. 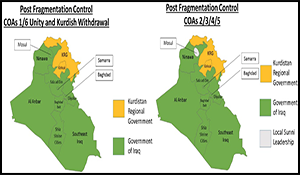 The study team assessed how a change in either the CJTF-OIR coalition or regional coalition could influence the tactical coalition post Mosul and the subsequent effect of these potential fragmentations on the GoI¹s ability to control Iraq. The study team established six potential post-Mosul future scenarios. One future consisted of the tactical coalition remaining intact and the other five consisted of different permutations of the tactical coalition fragmenting. The study team then modeled these six futures with the Athena Simulation and quantified their effects on both Mosul and Iraq writ large. During simulation these six fragmentation scenarios collapsed into two distinct outcomes: one in which GoI controlled Mosul and one in which local Sunni leadership controlled Mosul. The variable that determined the outcome was the involvement of the Sunnis in the post-Mosul coalition—if the local Sunni leadership remained aligned with the GoI, the GoI remained in control of Mosul. If the local Sunni leadership withdrew from the coalition the GoI lost control of Mosul and the local Sunni leadership assumed control of Mosul—regardless of whether any other groups left the coalition. Irrespective of the local Sunni leadership’s involvement in the coalition the GoI was able to maintain control of everything but Mosul and the KRG controlled areas of Iraq. This included historically Sunni areas of Al Anbar including Fallujah and Ramadi. While several permutations of the regional coalition fragmenting may take place, the centrality of the Sunnis to any outcome puts the actions of the GoI to forefront. PM Abadi’s desire to preserve the unity of Iraq may position the GoI at odds with calls for increased local autonomy from some factions of Kurdish and Sunni leaders. In the event of the chaos that would characterize violent civil conflict among Kurdish, Sunni and Shi’a forces—likely with proxy support from Turkey, Saudi Arabia and Iran respectively—the multi-ethnic, multi-sect members of the Iraqi Army and police will be hard pressed to know which battles to fight and more than breaking with the coalition outright, may for reasons of confusion and self-preservation simply fall and recede as effective fighting forces.